Buy Dead or Alive 5 Last Round for PS4 in India at the best price. Screenshots, videos, reviews available. The white-knuckle battles, furious combo strings, powerful special moves and engaging storylines - you love everything about the Dead or Alive franchise, especially the 5 series. Now, you can have the greatest parts of each installment in one package. Dead or Alive 5: Last Round represents the pinnacle of the Dead or Alive 5 series with a massive roster of fighters, extensive customization options and stunning visuals that showcase the power of the new-generation consoles - not to mention the exhilarating, adrenaline-pumping fighting action that is the signature of the Dead or Alive franchise. Get ready for the most comprehensive Dead or Alive 5 experience to date with this Last Round. 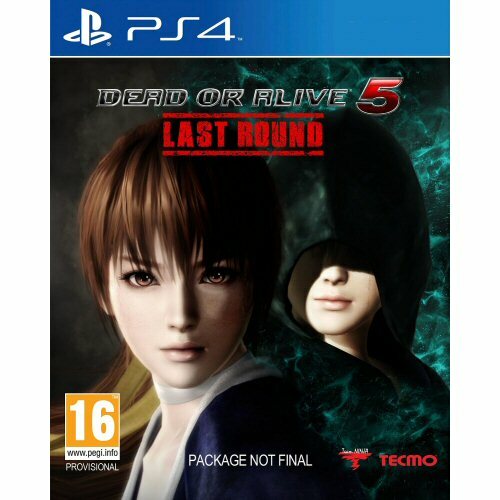 Composed of the best and brightest content from the series' games, as well as new content specific to this edition, Dead or Alive 5: Last Round delivers the thrilling, heart-pounding fighting action you love with a vast array of customization options. Immerse yourself in the battle with lifelike details and smooth striking animations. Jet set around the world to dynamic interactive stages that feature even more destruction, deadly new danger zones and boast more strategic choices you'll need to use to emerge victorious. Jump into battle with the largest roster of fighters ever assembled in a DOA game, which features Hayabusa, Hayate, Kasumi, Ayane, Rig, Momiji, Leon, Kokoro, Tina, Lisa, Brad Wong, Jann Lee, Hitomi, Leifang, Christie, Eliot, Leon, Gen Fu, Bayman, Bass, Zack, Helena, Marie Rose, Phase 4 and newly released Nyotengu, as well as Akira, Pai, Jacky and Sarah Bryant from the Virtua Fighter franchise. Personalize your gameplay experience with more than 300 open and unlockable costumes, new hairstyle and accessory options. Transfer your previously purchased DLC from your previous-generation console to PlayStation 4, and import your rosters, costumes and accessories from Dead or Alive 5 Ultimate to enhance your Last Round gameplay right out of the gate. Are you ready to dive into the most comprehensive Dead or Alive 5 action? Return to the Dead or Alive universe with this Last Round, which includes the best content and DLC from the Dead or Alive 5 series, as well as new content for a comprehensive Dead or Alive 5 experience. Engage in thrilling combat with the signature DOA fighting style and enjoy immersive, lifelike details and smooth striking animations that drop you in the heart of the action. Travel around the world to battle it out in dynamic interactive stages that feature even more destruction, hazardous new danger zones and additional strategic choices to use in your quest for victory. Choose from the largest roster of fighters in any Dead or Alive game, which includes Hayabusa, Hayate, Kasumi, Ayane, Rig, Momiji, Leon, Kokoro, Tina, Lisa, Brad Wong, Jann Lee, Hitomi, Leifang, Christie, Eliot, Leon, Gen Fu and more. Also features Phase 4 and newly released Nyotengu, as well as Akira, Pai, Jacky and Sarah Bryant from the Virtua Fighters franchise. Customize your gameplay experience with more than 300 open and unlockable costumes, brand-new hairstyle and accessory options. Import your run of rosters, costumes and accessories from Dead or Alive 5 Ultimate, and transfer all previously purchased DLC from previous-generation consoles.